In June 2017, IPIS launched its e-learning digital education package to support the early ratification and effective implementation of the Arms Trade Treaty. 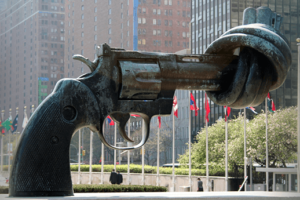 The Arms Trade Treaty (ATT) was adopted by the UNGA on 2 April 2013 and entered into force on 24 December 2014. There are currently 92 States Parties and 130 Signatories. Implementation of the Treaty is the responsibility of States Parties, while Signatory States have a duty to refrain from any act that would undermine the object and purpose of the Treaty. To support this process, the ATT Conference of States Parties (CSP) meets regularly to discuss implementation issues. Signatory States as well as observer States, international organisations, industry and civil society organisations can attend the CSPs. Intersessional meetings and working groups are also convened between CSPs. A Voluntary Trust Fund and an ATT Secretariat have been established to aid implementation. The CSP will meet again for the third time in September 2017. Further information on the ATT process can be found by visiting website of the ATT Secretariat. The objective of this e-learning course is to enhance knowledge of arms transfer control issues amongst key stakeholders. The course is an integral part of IPIS’ research program ‘Arms Trade and Security’ and of the Capacity Building program. The course contains 13 modules covering the key provisions of the Arms Trade Treaty. It is recommended to complete the modules in their numerical order. Nonetheless, users can also choose to complete them individually. This project has been funded by the United Nations Trust Facility Supporting Cooperation on Arms Regulation (UNSCAR) and IPIS. IPIS would like to thank the officials who participated in feedback workshops in Belgium, Costa Rica, Samoa, Senegal and Zambia for their valuable comments. Feedback is highly welcome and can be sent to info@ipisresearch.be. Click on the links below to access the e-learning modules in your preferred language.